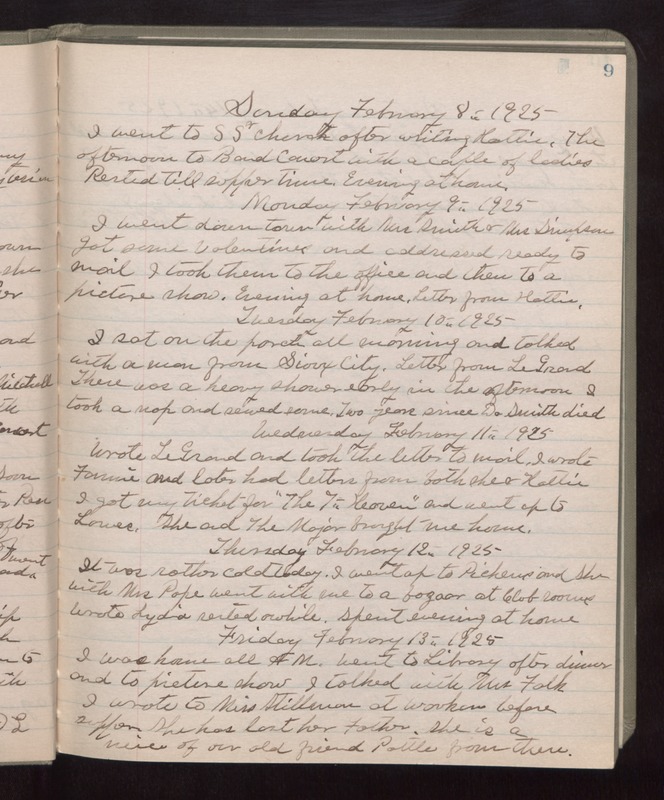 Sunday February 8th 1925 I went to SS & church after writing Hattie. The afternoon to Band Concert with a couple of ladies. Rested till supper time. Evening at home. Monday February 9th 1925 I went down town with Mrs Smith & Mrs Simpson. Got some Valentines and cards send ready to mail. I took them to the office and then to a picture show. Evening at home. Letter from Hattie. Tuesday February 10th 1925 I sat on the porch all morning and talked with a man from Sioux City. Letter from Le Grand. There was a heavy shower early in the afternoon. I took a nap and sewed some. Two years since Dr Smith died Wednesday February 11th 1925 Wrote LeGrand and took the letter to mail. I wrote Fannie and later had letters from both she & Hattie. I got my ticket for "The 7th Heaven" and went up to Lowes. She and the Major brought me home. Thursday February 12th 1925 It was rather cold today. I went up to Pickens and she with Mrs Pope went with me to a bazaar at Club rooms. Wrote Lydia, rested awhile. Spent evening at home. Friday February 13th 1925 I was home all AM. Went to Library after dinner and to picture show. I walked with Mrs Falk. I wrote to Miss Stillman at [Workam?] before supper. She has lost her father. She is a neice of our old friend Pottle from there.